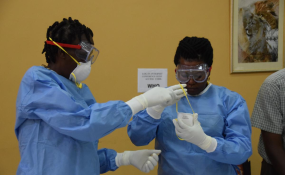 Health workers practice proper the donning of protective gear during training on vaccination against Ebola. Part of the response has been to try out new drug regimes. As such, research is playing a critical role as efforts are made to establish their efficacy. But testing new vaccines is an arduous and time consuming process. It's also hard in the case of Ebola because there are a few different strains of the virus. In the race between research and Ebola, a vaccine candidate made by Merck is being tested. It's part of new strategies implemented to limit the number of deaths. Factors contributing to this include violence in the region during the recent presidential election. Unrest in North Kivu led to the destruction of an Ebola Transit Center earlier this month in Katwa. Then at the end of February two more centres were burnt to the ground in Katwa and Butembo. On top of this, armed rebel groups in the area are limiting people's access and hampering the response. The Merck vaccine that's being used in the DRC has gone through several research studies. But it's still not licensed and can't be used in the same way as any other vaccines. Since May 2018 more than 40,000 people have received Merck's rVSV vaccine in Equateur and North Kivu. The rollout has been a joint effort run by, among others, the Ministry of Health, Institut National de Recherche Biomédicale, World Health Organisation (WHO) and Medécins Sans Frontieres. Other treatment options are also being tested alongside the vaccine. People who manage to get to an Ebola treatment centre and who test positive for the disease now have the opportunity to receive four new treatments being tried out. This is part of a clinical trial - the first of its kind - assessing the efficacy of these treatments. One of them was developed from the blood of a survivor of the 1995 Ebola outbreak in Kikwit, DRC. Developed by Janssen Pharmaceutical, this works differently to the Merck vaccine. Results so far show that it can provide protection for one year and could be used in areas not yet affected by Ebola (preventively). For its part, rVSV could be used reactively - that is in response to contacts of confirmed cases.